In one word, p.m. means “post meridiem”, which means “after noon” in Latin, but a.m. means “ante meridiem”, which means “before noon” in Latin. As everyone knows, nowadays majority of clocks are 12-hour clocks. 12-hour clocks divide 24 hours in a day, which in turn is divided into two 12-hour periods. Period “ante meridiem”, which, as said before, means “before noon”, applies on period between midnight, which is 0:00, and noon, which is 12:00. Period “post meridiem”, which, as said before, means “after noon”, applies on period between noon, which is 12:00, and midnight, which is 0:00. This is why every hour of the day, except midnight (0:00) and noon (12:00), is suffixed by p.m. or a.m. to identify whether the certain hour is in the morning, afternoon or evening. 24-hour clock usually displays the number of hours which are passed since midnight. For example, 19:00 hours on a 24-hour clock on 7th of May means, that 19:00 hours are passed since midnight of 7th of May. Interesting, that format of 24-hour time is sometimes known as military time. The 24-hour clock is used in several specialist areas, for example, military, aviation, navigation, astronomy, meteorology, emergency services, hospitals, computing, logistics, tourism and other areas, where 12-hour clock is deemed too inconvenient, burdensome or even dangerous. It is believed, that Egyptians are responsible for dividing the day into 24 equal parts. One source considers that this is because they used the base 12, but other source considers that this is because they used system of 36 groups of stars, which were known as decans and which told time at night. Often people get confused, because they do not know, whether to use 12 p.m. or noon. Actually it does not make sense to use a compound “12 p.m.”, since it is not after noon. Also it does not make sense to use a compound “12 a.m.”, since it is not before noon. To avoid any confusions it is recommended to call these hours as noon and midnight. It should be mentioned, that majority of digital clocks show 12 p.m. and 12 a.m. to identify, whether it is noon or midnight. Now let’s talk about midnight. Some people get confused, when they are asked to pick up their friend at the airport at midnight of May 7, because they do not know, whether they have to pick up their friend at the beginning of May 7 or at the end of May 7. When people say “midnight”, it is confusing, because it is unclear, whether they mean the midnight at the beginning of the day or the midnight at the end of the day. It is because midnight is the time, when the date changes from the previous to the next. One solution of this problem is to say 12:01 a.m., May 7 or 11:59 p.m. May 7. Other solution of this problem is to use the 24-hour clock format. For example, if your friend asks to be at the airport at 00:00 on May 7, you should be there at the beginning of May 7, but if it asks to be at 24:00 on May 7, you should be there at the end of May 7. If you hope to lead a financially successful life, you need to have a correct mindset about money. However, even that is just half the battle. And like every battle, you need a plan – a strategic one. From research, we find that people who are successful are those who have a healthy dose of optimism and an understanding of strategic investing. Sounds like a lot, right? Well, not really per saperne di più, clicca qui. There are loads of people who are self-made millionaires. In other words, whatever wealth they currently have, they earned. And if they could earn that much, it means that you can too. 1. They are actively involved with their money: You must develop a very close relationship with your money and assets if you want to be financially successful. Budgets, planning, tracking of expenses, and investments are tools the wealthy can’t do without. Ignoring your finances and its attending responsibilities in the hopes that they will go away will never make you rich. You must man up to them and work to understand your money. 2. 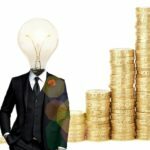 They are frugal: Looking wealthy and actually being wealthy are two very different things – as different as day is from night. If you want to be wealthy, you must learn to live not at, certainly not beyond, but below your means. This will leave you enough funds to go into investing. Invested money is like an employee that works for you and brings you more income. Expenses that make you look rich are liabilities, unlike investments, they don’t give; they take. 3. They know what matters: Now, even though we’ve said that the rich live below their means, it’s not true that they don’t spend at all. As a matter of fact, they do. However, they know what their priorities are. They don’t spend on everything. Don’t get pressured into spending on things you truly don’t give a hoot about. Reflect on what matters most to you and channel your resources accordingly. 4. They are optimistic: Financially successful people are generally optimistic – even about failure. They are self-driven and motivated, which ultimately makes them more productive and creative. 5. They create opportunities: Qui sera sera? Not for these guys. They don’t wait for life to happen. They go ahead and happen to life by creating the opportunities they’d like to see instead of waiting for someone to hand it to them. 6. They set SMART goals: If you don’t know where you’re going, how would you know when you get there? Would you even get there? This is what goal setting helps the financially successful do. It gives them something to work for. Just remember the rule: your goals must be Specific. Measurable. Achievable. Realistic. Time-bound miglior diffusore oli essenziali. 7. They seek knowledge: Financially successful people are constantly seeking to know. They always look for a second, third, fourth, (and even fifth if need be) opinion before making any decision. They take their financial literacy seriously and always strive to keep abreast of current happenings . Yeah, so here are some of the most important habits of financially successful people. Pick them up and you’ll soon be a financially successful person yourself. Daylight Saving time or, in other words, summer time transition is regulation of clocks to get more hours of daylight in evenings, but less daylight hours in mornings. 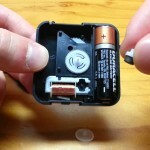 Daylight saving time, as one might guess, is meant for saving of electric power. Transition to summer time happens in spring, when clock indicators are turned one hour forwards. In autumn clock indicators are turned one hour backwards. 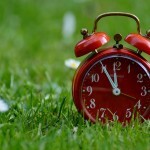 Daylight saving time is time counting system, which is used in periods of summer and spring. Daylight saving time is one hour ahead of the time of time zones. The majority of countries uses daylight saving time from the last Sunday of March to the last Sunday of October, when clock indicators are turned one hour backwards again. The idea of daylight saving time arose in the end of 18th century. In the year of 1784 Benjamin Franklin, an envoy of USA, which was living in Paris, wrote an essay “Summer Time” and sent it to his friend, which was an editor of “Journal of Paris”. An idea, which is presented in Franklin’s essay, arose when some sudden noise disturbed his sleep in 06:00 a.m. When Benjamin Franklin woke up, he was surprised by the bright light, which was illuminating his bedroom. It was the moment when he had the idea about daylight saving time. Performing simple mathematical calculations, Franklin worked out, how much money residents of Paris spend, when they go to bed after midnight and wake up only in lunch time, in period of time from 20th of March to 20th of September unnecessarily burning candles and kerosene lamps. Nowadays daylight saving time is realized by 76 countries all over the world, but it does not mean that in these countries transition to summer time occurs at the same time. In 10 of these countries transition to summer time occurs in different times. It is interesting that the majority of countries, which is 128 countries all over the world, does not use daylight saving time. In majority of countries, which use daylight saving time, transition to summer time happens on the last Sunday of March, when at 03:00 a.m. clock indicators are turned one hour forwards, namely, to 04:00 a.m. . 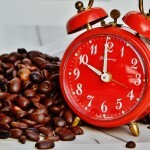 In last years there are a lot of discussions about usefulness of daylight saving time and its influence on health. It is scientifically proven that daylight saving time reduces the amount of used electric power, as well as reduces the number of traffic accidents and crimes. Almost everyone, but especially those, who live in northern countries, feels depression of dark season. An extra hour of daylight improves psychological and physical health, as well as the sense of safety. But there are negative aspects of daylight saving time too. Transition to summer time influences some people’s physical health and emotional well-being for some period of time, affecting their feeling and work capacity. There are a lot of public organizations all over the world, which are trying to achieve the cancellation of daylight saving time. Every argument has a counterargument. Everything that is saved at the expense of lighting, is spent for heating in mornings and conditioners in noons. Daylight summer time disorganizes biological rhythms, but serves an extra time and sense of safety in evenings. Local tourism gets income, but international carriers gets losses. Environment gets less pollution in mornings, but more pollution in evenings. Despite the fact that a lot of researches do not prove the economical and social effect of daylight saving time, majority of economically developed countries supports regime of summer time. As everyone saves money at the expense of lighting, there is no need for fast loans, because everything can be purchased with personal means. Time zone is a certain area of Earth in which people are using united and standardized time. Earlier people were using local time which was known as Sun time and which was different in every place on Earth. Because of development of telecommunications and railways it become inconvenient. The problem was sold by time zones. 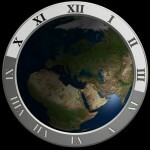 Each time zone includes certain regions which are using united Sun time. Time zones are generally based on meridians which form one hour difference between collateral time zones. However, this division is not so simple and universal as it may sound, because usually borders of time zones are drawn along borders of countries, states and other administrative units. Today there are 24 times zones, but the total number of time-shifting is 51. Nowadays only 42 of them are used, but other 9 are not used any more. In the year of 1878 sir Sandford Fleming developed the system of time zones for whole world which is still used. Sir Sandford Fleming was a Canadian engineer and inventor who not only proposed worldwide standard time zones, but also designed Canada’s first postage stamp. He left huge influence on surveying and map making, as well as on engineering of the Intercolonial Railway and the Canadian Pacific Railway. It should be mentioned, that he was a founder of the Royal Canadian Institute, which is a science organization in Toronto, and a founding member of the Royal Society of Canada. Railway companies of United States of America started to use Fleming’s system of time zone only on November 18, 1883. When sir Sandford Fleming missed his train in the year of 1876, when he was in Ireland, because he had a schedule, which was listed p.m. not a.m., he offered to the world a single 24-hour clock, which was located at the centre of the Earth, not linked to any meridian. Later he linked it to the so called anti-meridian of Greenwich, which is 180 degrees now. He suggested that standard time zones can be used locally, but they have to be subordinated to his single world time or, as he called, to Cosmic time. He was promoting his system at major international conferences and experienced different reactions. However, by the year of 1929 all major countries in the world had accepted his system of time zones. Greenwich meridian or, in other words, prime meridian, which is based at the Royal Observatory in Greenwich, was established by sir George Airy in the year of 1851. The International Meridian Conference in selected the meridian which was passing through Greenwich as the official prime meridian. France abstained from voting and continued to use the name of Paris meridian for several decades. The prime meridian is passing through the Airy transit circle of the Greenwich Observatory and is marked by a powerful green laser shining across the London night sky. The Greenwich Observatory, which is known as the Royal Observatory, is an observatory which is situated on a hill in Greenwich Park and which played a major role in the history of astronomy and navigation. Actually time management is a myth. How it is possible to manage the time? It is like a river which simply flows. It is impossible to stop it or turn it back. Time does not change. Everything, that we can manage, is ourselves and the way we spend the given time. Time management is an aim. The aim of time management is to change our behaviour. In general it is a plan, how to manage our habits, not the plan, how to manage the time. It is necessary to set clear objectives and to follow them for a certain period of time to see, whether we have achieved them or not. We have to introduce our daily regime and to follow it, because who is responsible for our lives, if not we ourselves? 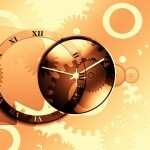 It is believed, that today, in 21st century, there are refined instruments of time management. It is not true. It does not make sense, whether it is some planner, program, diary or a piece of paper – the most important thing is to understand, for what purposes the time is spent now, and to develop a plan, for what purposes it will be spent hereafter. We have to find out things, what our time is spent for. Maybe we have become victims for some time thieves? Just think about the time, which is spent for surfing in the Internet, for reading of e-mails or for talks on the phone. Maybe we are surrounded by people, who are used to that we are devoting all of our attention only then, when they want it. Why do we not love ourselves? Maybe we are available any time, when they want to talk to us? What do we get from gossips? Maybe we are called every time, when something is burning? Are we firemen? We have to learn to set our priorities. Nevertheless, how big is our business or how big is a heap of our houseworks, we are not alone. We have to relay on others and let them accomplish some works. We have to be smart and to avoid works, that we do not like, letting others to do them. Only after that we will be able to see some changes of our productivity. Split your priorities in four dimensions or, in other words, in square on basis of important and urgent works. It is important to set the term. Have you noticed, that when we are doing works that we like time passes unnoticeably? But there are works that linger all day long as well. Also there are works that we are doing only to avoid works, that we just hate. Often these works are works which are obligatory. That is why we are trying to avoid them, but by avoiding them we are fooling ourselves, because we know that sooner or later we will have to accomplish them. Do not waste your time on standby. It is clear that this is impossible to avoid waiting of something or someone. For example, rows, traffic jams, unpredicted situations and chronically retardants. It is recommended to get some alternative for situations like these, for example, some book for reading or piece of paper for sketches of creative ideas. Hourglass, sometimes called as sandglass, sand watch, sand clock or sand timer, is a mechanical device which is used for measurement of time. Hourglass consists of two glass bulbs which are connected vertically by their narrow endings, forming a special neck. Neck is the part which ensures regulated trickle of sand from the upper bulb to the lower one. Factors which are affecting the time interval are the amount of sand, the coarseness of sand, the size of bulbs and the width of neck. When the upper bulb is empty, hourglass may be inverted, and the countdown resumes from the beginning. The origins of hourglass is unclear. It is believed that hourglass is a successor of clepsydra or, in other words, water clock, which may have been invented in ancient Egypt, therefore, hourglass may have been invented there as well. The American Institute of New York considers, that hourglass was invented in Alexandria about 150 BC. The Journal of British Archaeological Association believes, that hourglass was used before the time of St. Jerome about 335 AD. The first representation of hourglass was found in a sarcophagus which is dated c. 350 AD and which represents the wedding of Peleus and Thelis. This sarcophagus was discovered in Rome in the 18th century and was studied in the 19th century. Interesting, but there is no records about hourglass in Europe before the Early Middle Ages. It was not mentioned anywhere until the 14th century, but then Ambrogio Lorenzetti painted a fresco “Allegory of Good and Bad Government” in the year of 1338, which is believed to be the earliest evidence of hourglass in Europe. After 14th century there were a lot of records about usage of marine sandglass. The majority of these records were from logbooks of European ships, but it appears in other records and lists of ships stores as well. Marine sandglasses were popular on board ships, because they were the most reliable measurement of time during sailing in the sea. Unlike the clepsydra, the motion of ship during sailing did not affected the hourglass. Also granular materials inside of hourglass ensured more precise measurements, unlike clepsydra which was prone to get condensation inside of it because of temperature changes. Hourglasses were popular on land as well, because they were inexpensive and thus available to majority of people. Hourglasses were commonly used in such places as church, home and work place to measure sermons, cooking time and time of breaks. As they were commonly used for more practical tasks, the size of hourglass began to shrink. Smaller hourglasses were more practical and more discreet. After 1500, when the mechanical clock was developed, hourglasses became less popular, because mechanical clocks were more precise, practical and cheaper. 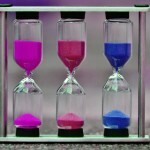 Of course, hourglasses did not disappear entirely because of their unique design. The glass bulbs of hourglass have changed in design and style over time. The bulbs were not always connected – the first hourglass had two separate bulbs which connection was wrapped with a cord to hold them together. Only in the year of 1760 both bulbs were blown together. The majority of hourglasses contains sand, but a lot of them contains granular mixtures of other materials. Earlier hourglasses contained powdered marble, tin oxides or even pulverized eggshells, but nowadays hourglasses contain synthetic materials. The name “calendar” comes from Roman word “kalendae”, which is used to refer the first day of each month. The name “calendar” is also related to the verb “calare”, which means “to call out”, referring to the calling of the new moon, when it was seen for the first time. The name “calendar” also may has come from Latin word “calendarium”, which means “account book, register”, as debts were collected and accounts were settled on the “calends” of each month. Calendar is a time counting system and a system of organizing days for different purposes. This is done by giving names to periods of time, for example, day, week, month and year. The astronomy is the key method of calculating a date and time. Stars create the stellar day, but the rotation period of planets regulates the seasons. 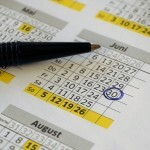 The combination of these processes is monitored and recorded by calendar. Generally calendar is based on movement of such celestial bodies as Sun and Moon. There are special calendars for Sun and Moon as well, which are called Solar calendars and Lunar calendars. It should be mentioned, that there are Lunisolar calendars too. Of course, there are calendars based on movements of other objects as well, for example, calendar of ancient Egypt, where a year is a period of time which passes between two rises of Sirius, but calendars like this are rare. Solar calendar is a calendar whose dates indicate Earth’s position on its revolution around the Sun. In other words, Solar calendar is a calendar whose dates indicate Sun’s position on the celestial sphere. 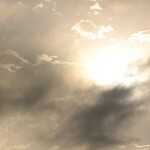 We can look at this question from two aspects – from the viewpoint of the Earth or from the viewpoint of the Sun. Solar calendars assign a date to each solar day. Solar day is a period of time between the Sun reaching its highest point in the sky two consecutive times. Solar day is also the 24-hour interval from one midnight to the following midnight. One example of Solar calendar is the Gregorian calendar, also called the Western calendar and the Christian calendar. The Gregorian calendar, which is widely accepted as standard in the world, is internationally the most widely used calendar. The Gregorian calendar was introduced in the 16th century as a modification of the Julian calendar. Lunar calendar dates the months and numerates the days, basing on cycles of the lunar phases. Taking into account, that the length of the lunar month differs from the length of the tropical year, Lunar calendar quickly drifts against the seasons, therefore, there is need for intercalary months. In order to synchronise the year a 13th month is needed every 2 or 3 years. As there are more than 12 lunations or, in other words, synodic months in a solar year, the period of 12 lunar months is often called a lunar year. One example of Lunar calendar is the Islamic calendar, which is used mainly for religious purposes, but in Saudi Arabia it is the official calendar. Lunisolar calendar is a Lunar calendar which has an extra month to realign the months with the seasons, therefore, it can be regarded as Solar calendar as well. Dates of Lunisolar calendars indicate not only solar days, but also moon phases. A sundial is the first ever device that can tell time and it was created some 4000 years ago by the Egyptians and was a crucial invention of that time. Sundials work by simply casting the suns shadow on a pre-set surface which has markings on it that show the precise time. The first ever sundial or sun clock as it is also called was a device that had a straight stick pointing towards the sky and it was able to tell time but not quite accurately enough. When Egyptians started to standardize the days length and divided it into 12 hours then more accurate sun dials were made that had a triangle shape where the top point was pointing towards the North pole and at the opposite side the half circle was divided into 12 distinct parts that we now know as hours. Imagine a time when you did not know what was the accurate time and you had to rely on the movement of the sun to predict when the evening will come. That must have been a very frustrating time because no one could be sure how much time is left till some particular date or time. And if measuring days would have been simple enough that people could have created a sense of what is the time then counting days and seasons would have been a much much harder task. Imagine what would happen if we did not know how to tell time to the present day. Every meeting should have to be scheduled only approximately any appointments would be pointless and we would have to go to sleep as well as eat only when out bodies would tell us to do that. People lived like this for thousands of years and survived but with the advent of mechanisms like this sundial we started to set appointments and predict when what would happen. A sundial was a great invention but it had its flaws because you had to make it stationary and it would show the time only when the Sun was shining and that is why there were only 12 hours not 24 hours on that clock. And also when the day was cloudy people again had no means of telling the time so you can imagine what would happen if everyone would rely on a clock like this but then a storm comes and every time telling device disappears. That is why people started to look for alternative methods of telling time and first they used the same materials to create a portable sundial but it did not work as well as you would like but later on some other methods proved to be useful. 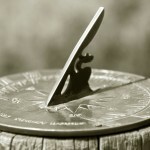 Till this day we can find various sundials around the world that are made as an art form or simply as a tourist attraction and these sundials can tell time accurately enough within 5 minutes and that is a great achievement knowing that these things were invented 4000 years before we were born. A quartz clock is a masterpiece of engineering as it uses the sam basic principles that the old pendulum clocks used but takes them to completely new heights and creates a much much smaller thing that can keep accurate time. At the basic level quartz crystal clocks work with the same methodology as regular clocks as they use a oscillating crystal to count seconds and keep that crystal constantly moving by applying force that in this case is an electric current. To understand how these quartz clocks work we first need to understand the piezoelectric effect that was discovered by Marie and Pierre Currie. This effect shows that when you distort some elements like quartz crystals they can create electric current. But also the opposite effect is true that when you apply an electric current to a crystal it will deform. And if you make that crystal in a precise shape and apply the right amount of electricity you can create a vibrating crystal that can be used in measuring time. If you have ever learned how to play a music instrument you may know what a tuning fork is in that it is a metal object that vibrates at a specific frequency when you hit on it. And exactly the same effect is used with these quartz crystals as they are also shaped like the tuning forks but they are really tiny and they are vibrating at 32769Hz per second and when you divide that number by 60 a couple of time you will get one and that is basically the beginning of one second. Because this crystal oscillates at a certain frequency when a current is applied then you can measure these oscillations and translate them into the motion of a clock hand but because that crystal will stop those vibrations within a couple of seconds you need to constantly jolt that crystal and keep that oscillating frequency constant. Modern Quartz clocks usually are accurate enough to loose only 1 to 5 seconds every month but because the same exact mechanism is also used in atomic clocks you can make timepieces that wont loose a second for millions of years. The basic principle why time is lost is that you can’t tune that quartz crystal the the precise measurement of time as ir will slowly stop oscillating and if you only jolt that crystal ever second then there will be some time lost in between those jolts and that will result in a compounding losses that will ultimately result in a second or two lost here and there. It is remarkable that we can create a time peace that is precise enough to tell time to such a degree of accuracy in such a small form factor and because of that we can not have clocks that are always righ and that will not loose time and we will always be where we what to be in time!